Can Fukuda Resolve the LDP-DPJ Standoff? The moderate but aging leader of the LDP, Yasuo Fukuda, has paid his debt of gratitude to the different factions which supported him in his successful bid for presidency by selecting important factional leaders to the top four positions in his cabinet. 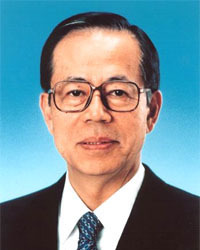 The most powerful factional leader, Nobutaka Machimura, now occupies the most powerful position in the cabinet after the prime minister which is that of the Chief Cabinet Secretary. In that position he not only has to prove his loyalty to Fukuda but also successfully break the deadlock with the Democratic Party of Japan over the renewal of the Anti-Terrorism Law which comes up for renewal in the next Diet session. Ichiro Ozawa, the leader of the DPJ after having successfully opposed LDPï¿½s pro-US policy is now playing god. Ozawa has a majority in the upper house and he wants to ride the wave of his popularity by forcing the LDP to dissolve the lower house and hold snap pools where he hopes to win a majority and form a government. Fukuda understands that he has a daunting task ahead to break this stalemate and must come up with a solution that would be a win-win situation for both the LDP and the DPJ. But he cannot do this alone. Not only the eight factions which supported him but also Taro Aso who lost his bid for presidency should be roped in to woo the DPJ to allow Fukuda to pass the Anti-Terrorism Law. At present the public approval of Fukudaï¿½s cabinet is over 56 percent, but this can quickly change if the factional leaders do not act quickly to woo the DPJ. Machimura has already visited the offices of the DPJ and other opposition parties to seek their cooperation, but he has not clearly spelled out his plan of action. A bemused bonhomie is not enough for winning the support of the opposition parties. They need a concrete plan from the LDP that would include the goals and objectives of the opposition parties before they would support any bill initiated by the LDP in the upper house. Fukuda's moderate and consensual politics may give him more strength than his predecessors to manipulate an impossible situation to his advantage, but he too must come up with a concrete plan to offer to the DPJ. Not only must he contain the belligerency of the DPJ but also the heightened suspicion between the bureaucratic and ministerial cadres. The bureaucracy has been somewhat miffed by the sudden changes and dismissals in their ranks conducted the erstwhile prime ministers. Perhaps the best solution before Fukuda would be to convince the DPJ to support the US-backed Anti-Terrorism Law and then dissolve the lower house and hold fresh elections. Any half-way solutions will not work with the DPJ which is now ready to strike back at the LDP's hegemony and carve a niche for itself.